We are a group of ordinary people, who are learning to love and trust one another as we explore what it means to live out the Christian life in the 21st century. We accept people as they are because that is how God accepts us. Our aim is to Help People Follow Jesus. In our church you will find young and old, couples and singles, young families, older families and single parent families. There are people from all sorts of backgrounds, but although very different we have one thing in common, in our personal lives and in our life as a church we are trying to follow Jesus Christ. We proclaim the good news of Jesus Christ as found in the bible, by preaching, teaching, in caring relationships, and in a programme of activities for everyone. 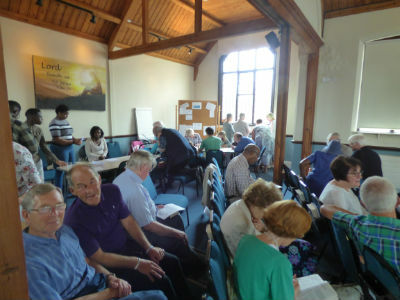 We meet at 10:00am every Sunday Morning at Hoddesdon Baptist Church, Burford Street. We also have various meetings at 7:00pm Sunday Evenings. You would be very welcome at any of our services. If you would like more information then do contact us. For more information about Hoddesdon Baptist Church, click on the links to the right.